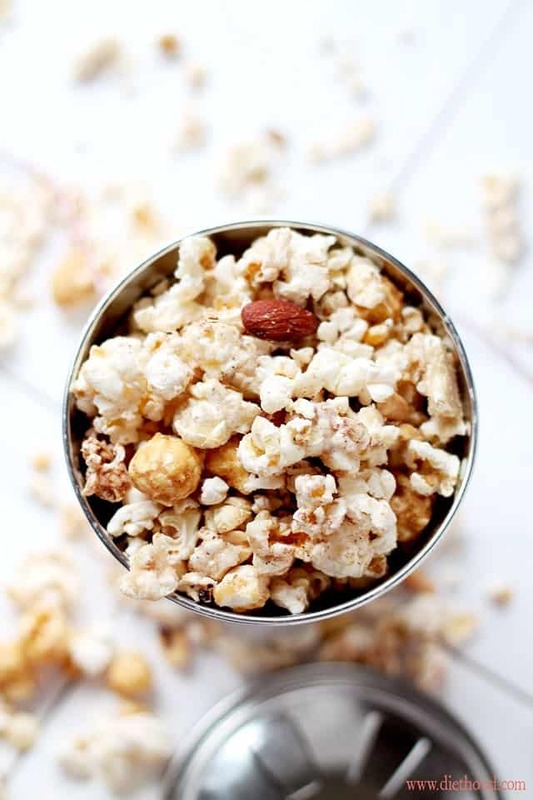 White Chocolate Brown Sugar-Cinnamon Kettle Corn – Delicious and festive Kettle Corn covered with melted white chocolate, brown sugar and cinnamon. Friends, TGIF! This week… ugh. Ridiculawwwwz! Let’s talk about popcorn and lost memory cards, m’kay? I took a bunch of photos of this delicious pretty little thing called kettle corn, and because I like to take 248 photos of every.thing. I make, I filled up my memory card fairly quickly. Ok. No biggie. I inserted a new memory card, snapped a few more photos and put the camera down as soon as I was finished. When I went to edit said photos, the full memory card was nowhere to be found. PANIC set in. It doesn’t take long for me to start freaking out. I felt my heart racing and I *think* there was steam coming out of my ears. I was furious. I still am! I looked everywhere for the darn card and I still can’t find it! What could I have done with that card?! I mean, I do like to vacuum twice a day, but I really don’t think I sucked it up… However, considering all other things, I probably did. I’ve sucked up toys, money, candy and now maybe even my memory card. I let the vacuum clean-up everything that gets in our way. I’m too lazy to turn off the vacuum cleaner, bend down, pick up the toys, turn the vacuum back on… Too much work… ain’t nobody got time for that. Well, anywho. Because of that you and I are going to chill with only one kettle corn pose today. So. I popped some kettle corn in the microwave and poured white chocolate all over it. To top it off, I also added some cinnamon and brown sugar. And there’s your recipe… easiest recipe, ever. Unless you’re way cooler than I, and your Friday night consists of martinis, loud music and make-up, you need not make this A.S.A.P. But you should. However, if your Friday night consists of Netflix, screaming children and a pony tail, make this awesome popcorn and try to share. It’s so good, you probably won’t want any other hands anywhere near it. You’ll see. 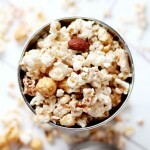 Delicious and festive Kettle Corn covered with melted white chocolate, brown sugar and cinnamon. Place popped kettle corn in a large and deep mixing bowl; set aside. Melt 3/4-cup white chocolate chips. Pour melted chocolate chips over popcorn and stir until combined. Add brown sugar and cinnamon and continue to stir until well blended. Mix in the remaining chocolate chips and mixed nuts. Can this be my dinner? Looks fabulous! Whoa very unique and I love the white chocolate for popcorn. Never had it yet, but love to try this recipe! 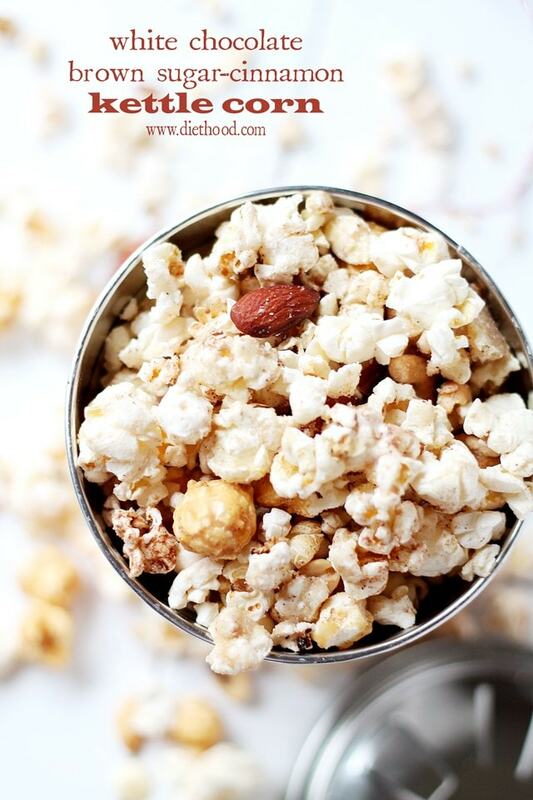 You got the one perfect kettle corn pose Katerina, and it looks delicious! Pinning and sharing! It doesn’t matter how many pics of this popcorn you post. I want it. Like now. For breakfast! Oh my Friday night definitely needs this popcorn, and the sooner the better! You had me at kettle corn!! Lol and seriously ain’t nobody got time for that!! Hee hee! You are a riot Kate!!! This popcorn looks fantastic!! My vacuum cleaner looks forward to me making a batch. Don’t get me started on lost memory cards, or not working card readers, or misplaced camera battery chargers….. I think this popcorn pose is gorgeous! And oh, I remember those exciting Friday nights. Then, I got a food blog and they all stopped! but it’s worth it, right? I’m a single pose kinda gal so while I’m sad that you can’t find your memory card, the one shot doesn’t bother me. Though I have to say, I can’t believe you vacuum twice a day. I’m lucky to get it done once a week! Anyhoooo, the kettle corn looks amazing. You know I love me some white chocolate.